The kidnapping of a businessman in broad daylight from a street on the Upper East Side draws forensic specialist Lincoln Rhyme and NYPD detective Amelia Sachs into the case of The Composer, a mysterious individual who posts live video of his victims online as they slowly strangle to death. The videos are set to eerie music he arranges especially for the occasion, including samples of the sounds produced by his victims’ struggles. The chase soon leads them to Italy, where they take on a consultative role in Naples with Inspector Rossi of the Police of State, Prosecutor Dante Spiro, and an unlikely Forestry Services officer, Ercole Benelli, as The Composer continues his strange kidnappings overseas. What follows is a typical Rhyme case filled with forensic evidence, inter-service tensions, and surprising, timely action involving refugees from north Africa and the Middle East. 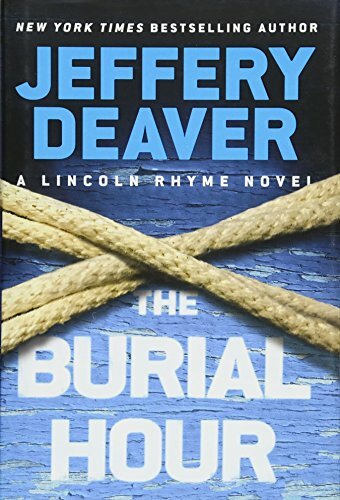 Jeffery Deaver is a veteran author, having published more than 30 novels, and The Burial Hour is the 14th in the Lincoln Rhyme series. By now readers are quite familiar with wheelchair-bound Rhyme, former NYPD head of forensics, and Sachs, his eyes and ears at crime scenes. Forensics take center stage, as always, and readers are regularly presented with charts and lists summarizing the physical evidence collected at each scene. Series regulars are left behind in this one, however, as Deaver brings in a lively team of Italian characters who engage the reader and keep the story interesting. The forestry officer, Ercole, is particularly endearing. Deaver’s best achievement in characterization in this novel, however, might be The Composer himself. The novel barely scratches the surface of his intriguing nature—held back, in fairness, by the demands of the thriller genre that things must keep moving along at a brisk pace. But his condition, and how it factors into the story, is arguably worth the price of admission alone. Watching Rhyme attempt to understand the mindset of The Composer is part of what makes The Burial Hour such an interesting novel. The whiteboard lists—admittedly a Rhyme staple—are a bit of an information dump that the eye tends to skim. Honestly, how many readers will zero in on the item “Small amount of sodium chloride, propylene glycol, mineral oil, glyceryl monostearate, polyoxyethelene stearate, stearyl alcohol, calcium chloride, potassium chloride, methylparablen, butylparaben” and be able to anticipate Rhyme’s brilliant deduction as to its significance? Isn’t it easier just to skip the darned list and wait for Rhyme to tell us that electroconductive gel was found at the scene? However, it’s understood that the analysis of physical evidence is the name of the game in this series, and the lists are an important part of the fun for Deaver’s readers. At the end of the day, The Burial Hour is a fine example of one of those novels where reviewers should just get out of the way so that avid readers and their favorite characters can come together for another good time. If you’re a Rhyme fan, don’t miss it. If you’re new to the series, climb on board and enjoy the read.